One great thing about living in Arizona is that we get to enjoy BBQ season year round!! This weekend I will be hosting a fun backyard BBQ sponsored by Miracle-Gro. Miracle-Gro came up with The Gro Project as a way to simplify gardening for a whole new class of gardeners and show that it can be easy, fun and enjoyable! While I am an avid gardener, I enjoy simple gardening projects as well. Here are a few insiring and fun garden projects that are not only cute but super simple as well. I am in love with this Toyrarium! I'm sure my girls would have a blast with it. The Ukelele Garden and Origami Garden would also be great conversation starters. 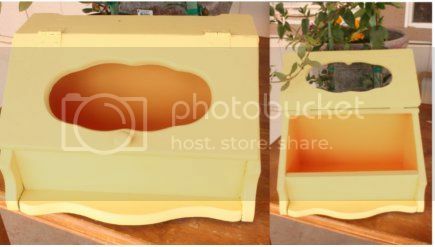 For my Gro Project I found this old bread box at a yard sale. The glass was broken so I removed it and gave the box a fresh coat of bright paint. I will be filling the box with Miracle Gro Moisture Control Potting Mix, ideal for container gardens – exclusive formula absorbs 33% more water than ordinary potting soil and protects against over and under watering! This will be a huge bonus since the Arizona sun loves to dry eveything out. Don't forget to check back to see my finished project! !